Chocolate Rice Crispy Squares. Rice crispy treats are one of those iconic recipes from childhood. 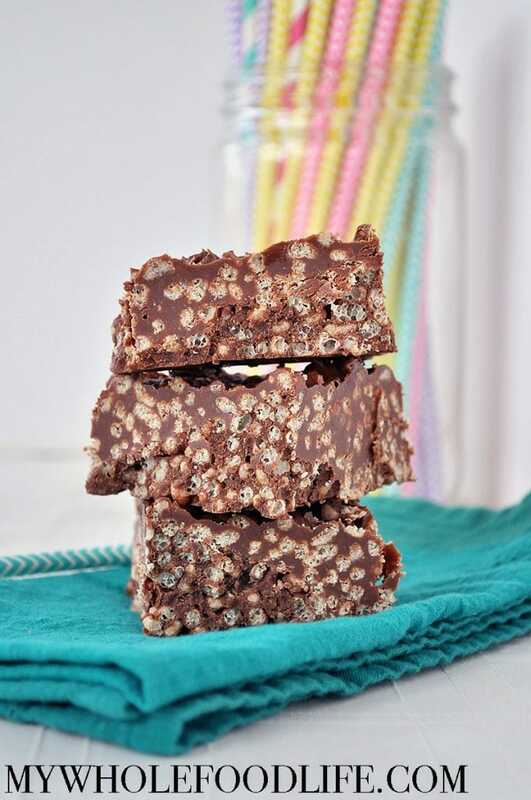 Well, I just gave them a major upgrade with these easy Chocolate Rice Crispy Squares. I love this recipe because it only contains simple ingredients. It also only takes a few minutes to prepare. If you love chocolate, you may also want to try my fudgy flourless brownies and my chocolate coffee cheesecake. These delicious chocolate bars are vegan and gluten free. They can easily be made nut free by using sunflower butter in place of the cashew butter. I used brown rice cereal in this recipe. Only ingredient is brown puffed rice. You should be able to find it at any health food store. I have also seen it at Target on occasion. A healthier twist on the classic treat! In a large saucepan , on medium heat, cook the cashew butter, chocolate chips, coconut oil and maple syrup. Make sure you are stirring often until the mixture is smooth. Once smooth, stir in the crispy cereal and remove from heat. Mix so that all the cereal is coated. Spoon batter into the baking dish and press the mixture down firmly. Place in the fridge to set. This should take about 30 minutes. Once the mixture has set, cut into bars and serve. These bars should be kept in the fridge or freezer. Enjoy! These look so yummy! I love that they seem much more healthy than typical treats. Thanks for sharing! So much chocolatey coating!!! Yum!!! This seriously is simple to make & satisfies "the chocolate sweet tooth". I tweeked it bit by adding 1/2 tsp vanilla extract @ the end of the recipe & topped it a touch of sea salt. I love the addition of sea salt. Bet that was awesome! Could I replace chocolate chips in equal measure with another flavor? Like vanilla chips? What could the coco be substituted for? Are you trying to make a flavor different than chocolate? Do you mean substituted WITH? If you are substituting FOR the cocoa (or coconut oil? What do you mean by "coco"?) that means you take the cocoa OUT and use something else. So if you want to use butter instead of oil, you substitute WITH butter. The fact that so many people are confused by this and use the wrong term means that everyone else is going to get confused, too.